Pressure Cooker Sweet Potato Casserole is a traditional Thanksgiving recipe, which nicely complements turkey and other side dishes. 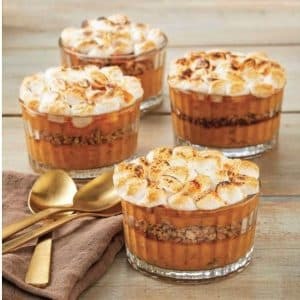 Instant Pot Sweet Potato Casserole. Sweet Potato Casserole is a recipe that has been on my Thanksgiving table since my earliest memories. My dad made and my Grandmother made their Sweet Potato Casserole simple. They both cooked their casseroles in the oven, as I did, for many years. I have made this Sweet Potato Casserole in the oven, in my 6 Quart Slow Cooker (with a triple recipe) and now also in my Instant Pot DUO Plus, Mealthy MultiPot or Pressure Cooker. My Pressure Cooker Sweet Potato Casserole is the quickest method and the taste is very good in all versions. The Instant Pot DUO Plus, Mealthy MultiPot or Pressure Cooker is still the best way for steaming the sweet potatoes or yams. 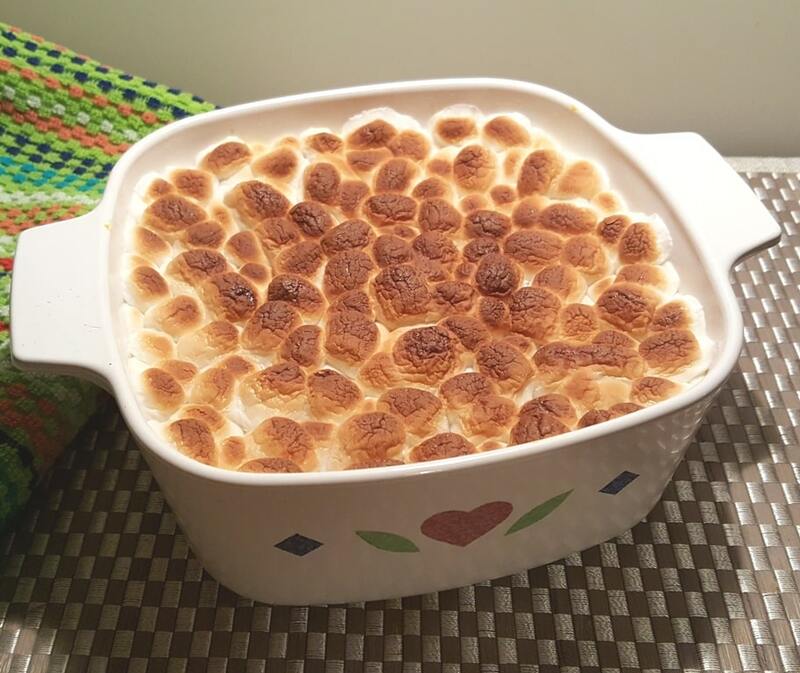 I forgot to add the Marshmallows into the photo, but suffice it to say, this Pressure Cooker Sweet Potato Casserole definitely uses Marshmallows! 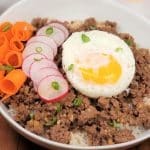 It is my very favorite part of this dish. The more, the better. For a fun twist, try using Pressure Cooker Homemade Pie Pumpkin Puree instead of Sweet Potatoes. It’s equally as yummy and makes for nice conversation at your Thanksgiving table. Sweet Potatoes and Yams (which are white inside with red skin) work equally as well. 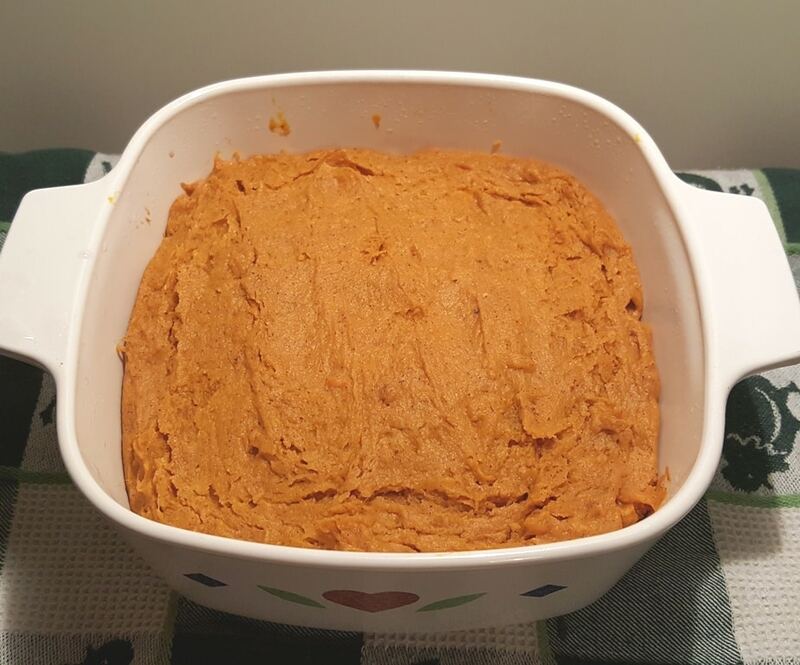 You can see the difference in color in my Instant Pot Ruth’s Chris Sweet Potato Casserole recipe. 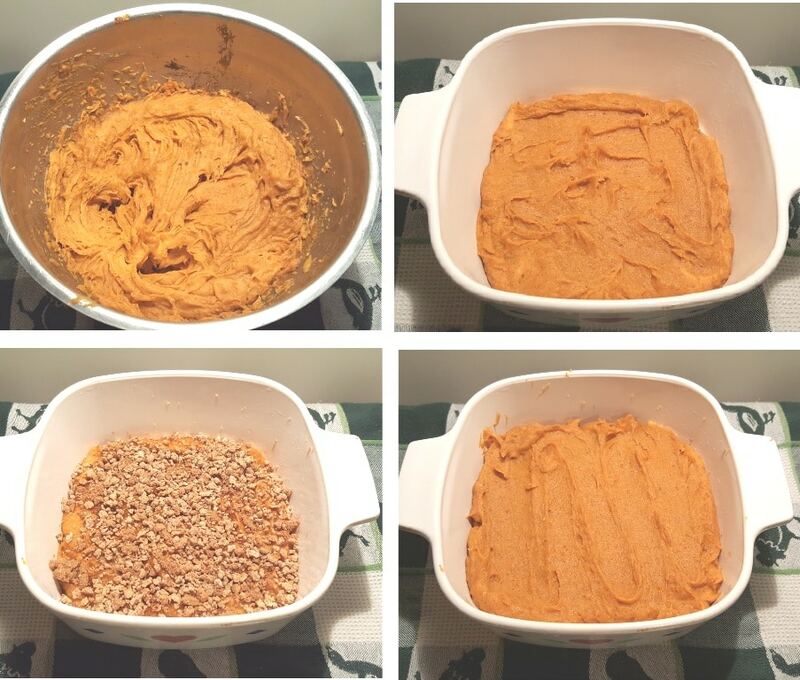 Don’t forget Pressure Cooker Homemade Pie Pumpkin Puree works well, in place of Sweet Potatoes! A good steamer basket makes things much easier. How to Make Instant Pot Sweet Potato Casserole. Grab a medium mixing bowl and mix up the filling for the Sweet Potato Casserole. When using nutmeg, you want to make sure to use only a slight dusting, as it is super strong. If using whole nutmeg, a sharp microplane is best for grating. 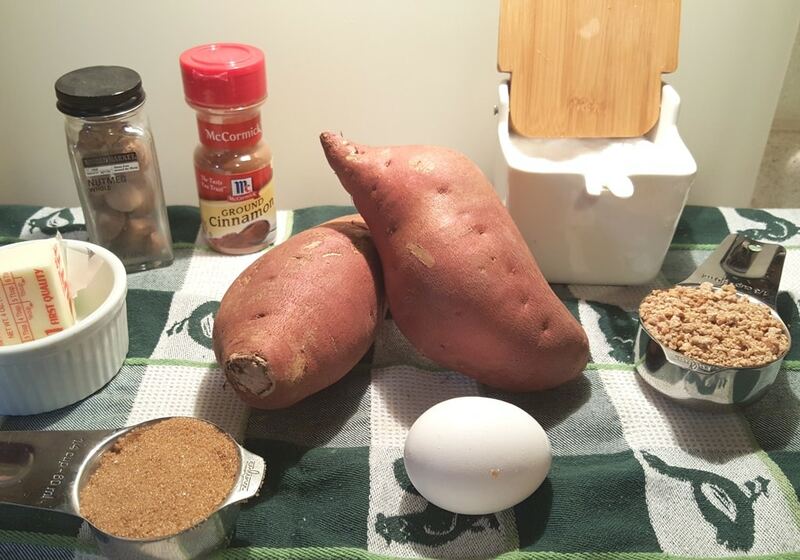 Egg helps to bind together the Sweet Potatoes and also helps them to rise. They become more of a Soufflé texture and will puff up nicely. Pressure Cooker Caramelize Sweet Potatoes is another delicious recipe to try. 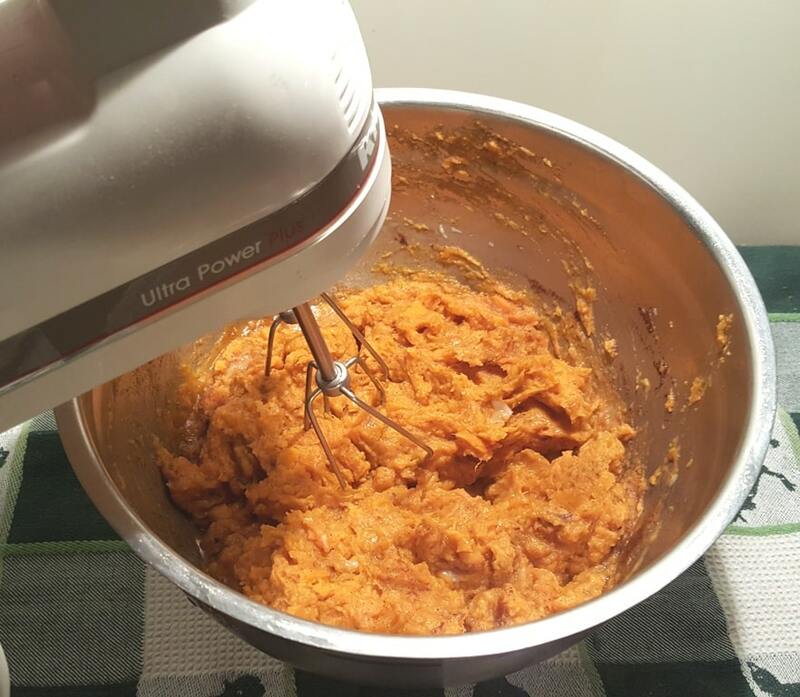 Whipping using an electric hand held mixer will incorporate air and help the Instant Pot Sweet Potatoes Casserole to rise. This is NOT a cheesecake, so in this instance whipping the eggs is a good thing. Speaking of cheesecake, my Pressure Cooker Holiday Spice Peppernuts Cheesecake, makes a great addition to your Holiday menu. As tradition goes, I always make my Sweet Potato Casserole in my Corning Ware Quilts 1.5 Liter Casserole Dish or my Corning Ware Quilts 3 Liter Casserole Dish. In keeping up with my tradition, I use my Corning Ware Quilts 1.5 Liter Casserole for the Pressure Cooker version too. Because of the handles, I cook the Casserole in my Instant Pot DUO80 (8 Quart) Pressure Cooker. The same size Round Corning Ware Casserole Dish, a dish without handles, would fit in my 6 Quart Pressure Cooker. If you want to double the recipe, use a larger casserole dish and cook in an 8 Quart Pressure Cooker or larger Pressure Cooker. The filling is totally optional. This part is not my tradition from early on. It only came into play about 10 years ago. If you don’t want a filling at all, leave it out. If you prefer the filling on the top, put it on the top. If you prefer actual nuts, instead of the Grapenut Cereal Nuggets, use nuts. 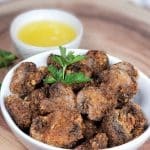 I don’t like nuts in my food, so Grapenut Cereal Nuggets for this recipe and also in my Slow Cooker Autumn’s Best Apple Crisp recipe. I make this Pressure Cooker Sweet Potato Casserole plain or with the filling. I like to switch off from Holiday to Holiday. Cover or don’t cover your Casserole Dish. 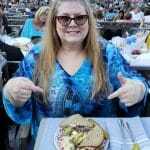 If you do cover it, poke holes or slits in the top. 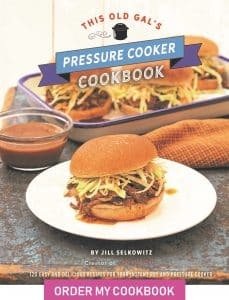 For a dryer Pressure Cooker Sweet Potato Casserole, cover it, for a wetter version don’t cover it. I prefer the wetter version myself. This Pressure Cooker Sweet Potato Casserole has puffed up nicely. You want to make sure to use a big enough Casserole dish to allow the Yams/Sweet Potatoes to puff plus allow room for yummy Marshmallows. Large or small Marshmallows both work well, although I do prefer using the Marshmallows. I think they look better, plus, the more Marshmallows, the better. Sometimes I even add a layer of mini Marshmallows as the filling, instead of the brown sugar/Grapenuts filling. I’ve actually done both, but don’t tell anyone. 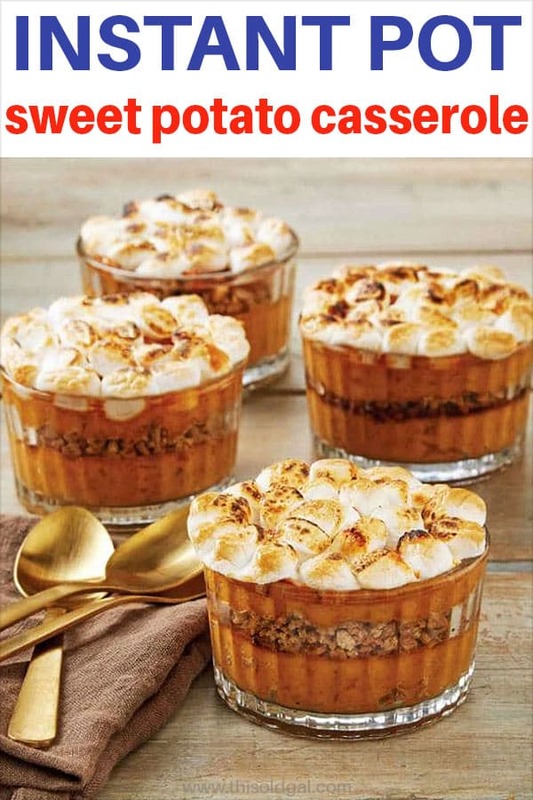 Alternatively, use a broiler to brown the marshmallows. 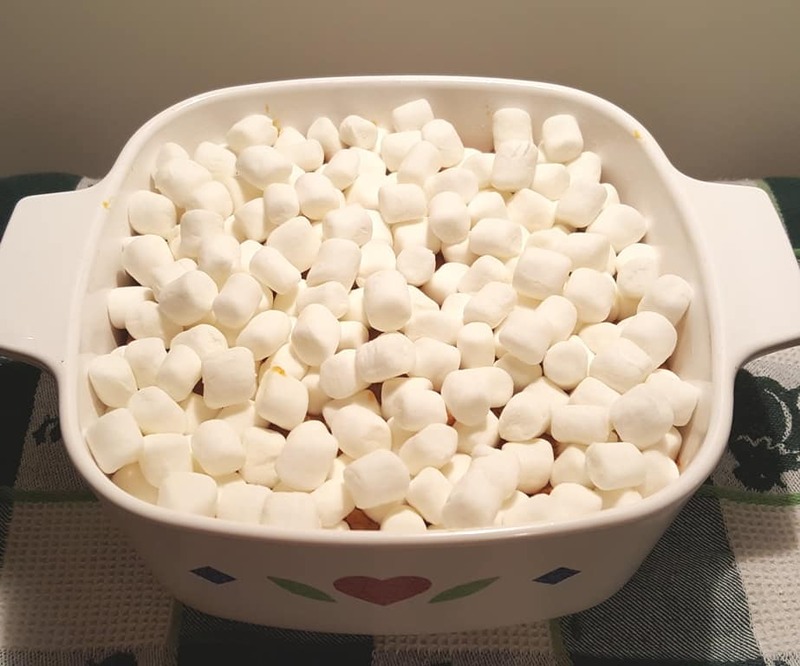 Large marshmallows work very well here and are what I usually use when making a large casserole. While this dish is a traditional Thanksgiving dish, I like to serve it all year round. If you want it sweeter or with more butter, just add in more. If you prefer a less sweet dish, well, you know what to do. There are many more Thanksgiving recipes for you to enjoy. Happy Thanksgiving! Add 1 cup of water to the Pressure Cooker cooking pot and place steamer basket of chopped yams/sweet potatoes. Lock on the lid and close Pressure Valve. When Beep sounds, allow a 5 minutes Natural Pressure Release. Do not dump out water. 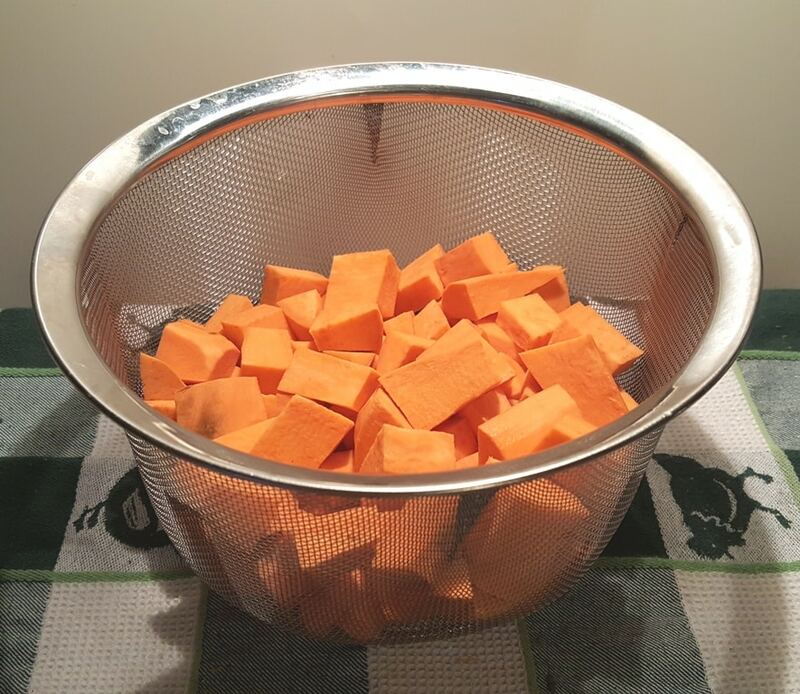 Remove yams/sweet potatoes from Pressure Cooker and place into a bowl. Add butter, egg, brown sugar, cinnamon, a slight dusting of nutmeg and a pinch of salt. 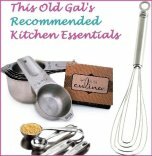 Use an electric mixer and whip. Pour 2/3 of the sweet potato mixture into greased casserole dish. Sprinkle the filling evenly over the sweet potato mixture. Gently spoon in the rest of the sweet potato mixture to cover filling. Add an additional 1 cup of water to your Pressure Cooker cooking pot. Cook at High Pressure for 13 minutes. When Beep sounds, do a Quick Release. Add marshmallows to the top of the Sweet Potatoes and place under low broiler for 1-2 minutes, or until the desired color is reached. 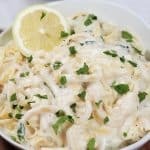 Layer ingredients into a 2 quart slow cooker and cook on LOW for 5 hours. Add marshmallows and cook an additional 30 minutes. Preheat oven to 350 degrees and cook for 30 minutes. Add marshmallows and place under LOW broiler until the desired color, about 1-2 minutes. Cook at 335 degrees for 20 minutes. Add marshmallows and cook at 400 degrees for 2 minutes more. 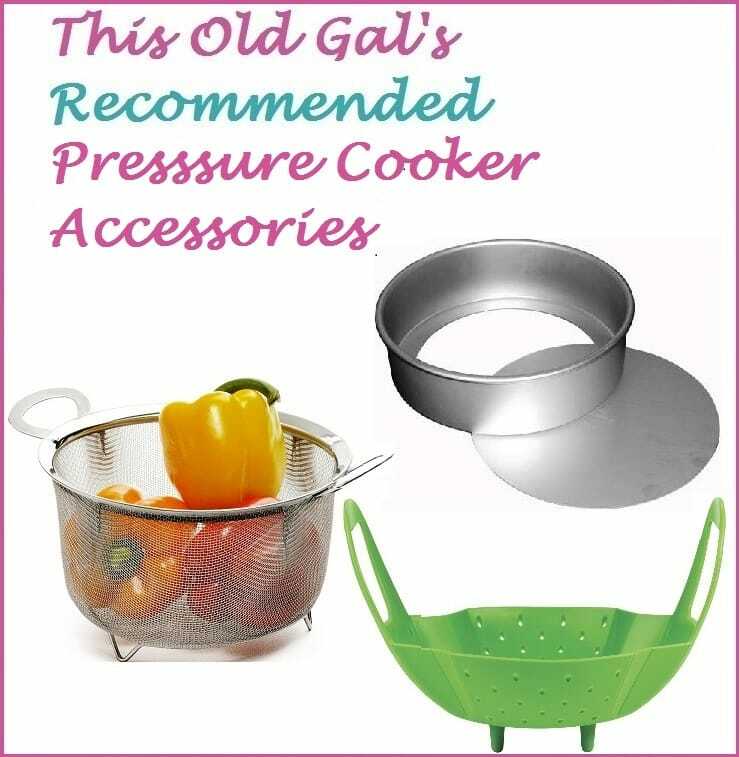 Use a 7 inch casserole dish (1.5 liters) for 6 quart or larger pressure cookers. Use a 7-9 inch casserole dish for 8 quart or larger pressure cookers and double the recipe for the 8 or 9 inch casserole dish. 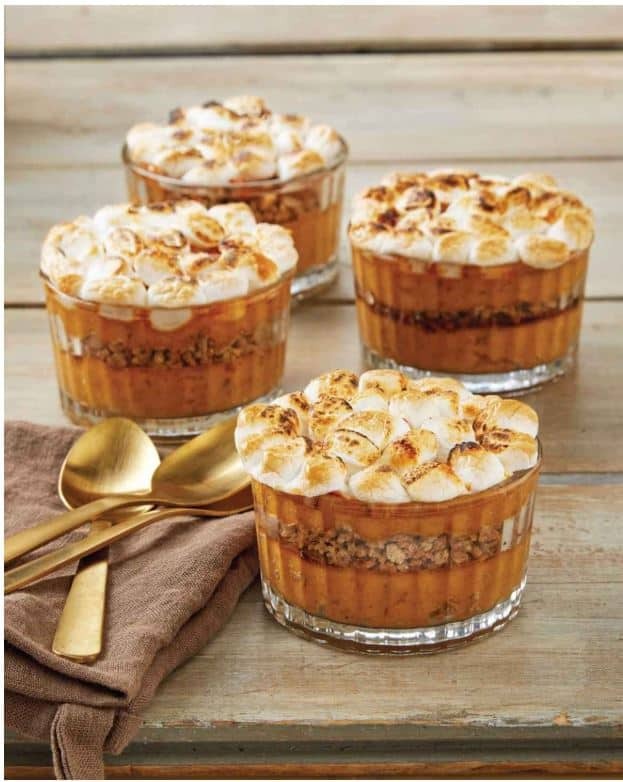 PIN this Traditional Pressure Cooker Sweet Potato Casserole! I was here again ? 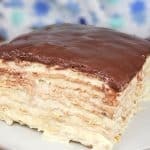 Thank you for all your great recipes! I love the cheesecake recipe & have made it twice now! Also pre-ordered your book, cannot wait to receive it!! 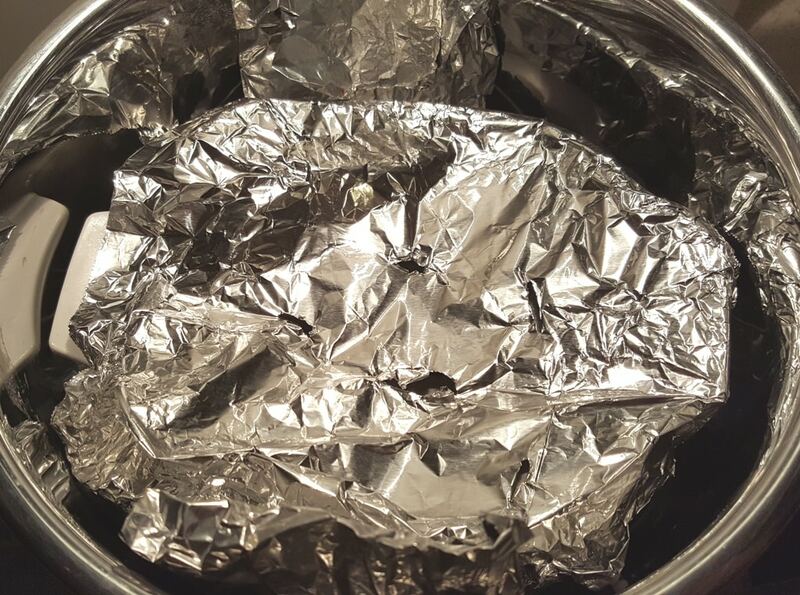 Can I make this in my instantpot using the disposable foil pans? I take it with me on the holidays and don’t want to have to leave any of my corningware there.